For someone involved in dance for most of her life, Ana Ines King still speaks with the enthusiasm and wonder of a child seeing her first performance. “We talk with our bodies,” she said – and she has done a lot of talking. In 2017, King marks the 20th anniversary of the Latin Ballet of Virginia, which she founded in Glen Allen and still leads as artistic director. On stage, her vision has incorporated local and Latin influences into expansive story ballets, and on the road, her frequent travels have connected Richmond and the world. In late August, King was concluding a week of workshops and performances near Mexico City and the resort of Acapulco. As part of a cultural exchange with the Ballet Folklorico de Mexico, King was teaching contemporary dance and sharing her recent work, “La Pasion de Poe,” based on the life and poetry of Edgar Allan Poe. In turn, the Mexican folkloric company was sharing its traditional dances – work that will flavor the eclectic and elaborate dance dramas conceived by King and produced by the Latin Ballet. “I [initially] called it the Latin Ballet because people [in Richmond] didn’t understand what folkloric dance was,” King, speaking from Mexico, recalled of her early days. 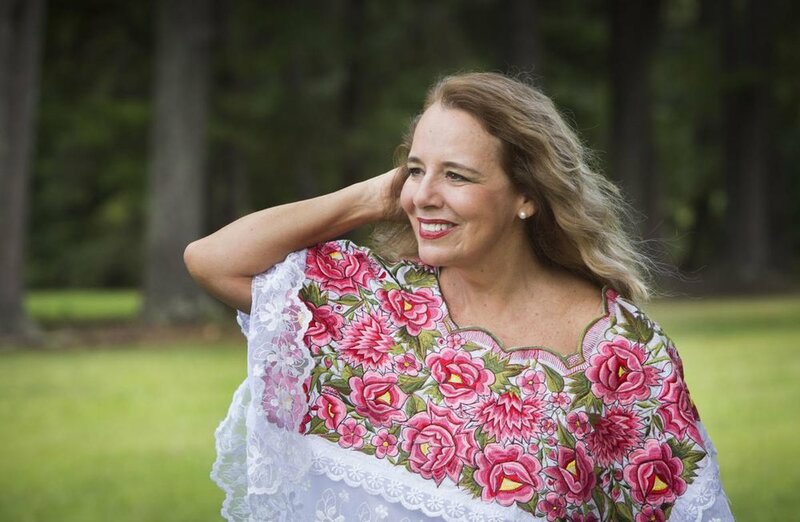 She first began offering free classes at the Cultural Arts Center at Glen Allen in 1997, and after much urging, she incorporated her company as a nonprofit in 2000. With a background in dance and design, she knew little or nothing about business. So with the help of husband William A. King, who owned Rountree’s Luggage Co., she exchanged upscale suitcases for legal work. In her native Colombia, King studied dance and choreography – and she still proudly wears her mother’s red bata de cola flamenco dress. She founded the Santander Jazz Ballet before moving to Richmond with her husband in the mid-1990s. Monte Jones, also known as Alfumega Meoleaeke A. Enock, fondly remembers the early days studying with King at Virginia Commonwealth University, where she taught dance. "I was young, and she had just gotten to America and she didn’t speak too much English,” said Jones, who ultimately spent more than 20 years with King. “She tried to build people up with a special kind of motivation that she has," Jones said. "Even in her mistakes she was teaching you. She would wow you off your heels. ... We were a family in the beginning” – a family in which a number of children left King's nest to launch careers as dance teachers and artistic directors. The "wow" factor even attracts veterans. Teri Miller Buschman, who joined the Latin Ballet in 2016, had danced professionally in New York for 10 years and thought she'd retire from dancing here. With $30,000 in grant money secured over the summer from Altria and CultureWorks, King is looking forward to extending the Latin Ballet's footprint – through residencies and workshops for the company’s Be Proud of Yourself educational outreach program to central Virginia schools, and through improved web development and social media. And then there's the busy performance season itself, which included a New York City tour in November. So her youthful radiance and enthusiasm will be fully on display, which she hopes will touch children especially. “I strongly believe that arts can change the lives of children,” King said. Recalling the shyness and low self-esteem she encountered in children in some communities she visited, she is committed to teaching them self-respect through dance. Tell us about a setback or disappointment and what you learned from it. It was not a disappointment but the biggest challenge of my life: the cultural shock of moving to the U.S. in 1991. Holiday celebrations, especially Christmas, were so different. I missed my family and the food, the celebrations, the traditions, the mountains. Oh my! And the precious colonial towns with their stone streets; cathedrals all filled with gold, silver and emeralds; and La Sierra Nevada de Santa Marta, one of the highest mountain ranges in the world at sea level. I love to go back to my country and visit Spain and South America because I miss everything I left. But I also love to live in the U.S., because I was lucky to find through my husband an amazing family in Richmond in an amazing place – Virginia – filled with history and pride. When I first came to Richmond, I went to a fundraising event at the Carpenter Theatre. I absolutely fell in love with the choreography of Chris Burnside, former director of VCU's department of dance and choreography. I was so impressed by the quality of dancing in Richmond! Soon, with my limited English, I decided to call Chris to thank him, introduce myself and tell him how important for me it would be to learn from him. I brought my portfolio with videos of recent works in Colombia, based on the literature of Gabriel Garcia Marquez. Chris told me his sister was a fan of Garcia Marquez and that he would see her the next weekend, so he took all that I brought to him. His sister fell in love with my work, and a few months later, I ended being part of the VCU faculty. The same day I met Chris, I also met Frances Wessells – the pioneer of dance in Virginia, a founder of VCU's department of dance and Chris' teacher. The next day, I received a call saying that Frances left for me her mother's castanets and a book about how to play them. What a privilege, ending up with her mother’s castanets! Frances is now 98 and collaborated with the Latin Ballet and me for 16 years, playing the grandmother in many of our productions. In South America, a grandma is the most important and respected part of the family! What is something about yourself that might come as a surprise to others? My love is to dance, but I also studied scenery and costume design. In Colombia, I used to work as a designer from 9 a.m. to 4 p.m. and direct my mother’s dance company from 5 to 10 p.m. every day. I designed costumes for dance and theater in Colombia and Venezuela, and I still design most of the costumes for the Latin Ballet. I also designed clothes and accessories for children and women in Colombia, and I designed leather goods such as handbags, belts, wallets, briefcases and suitcases for manufacturers around the world. I met my husband, who was the owner of Rountree's Luggage Co., while he was traveling to Colombia to buy leather designs. He was representing 400 stores from the U.S. and chose my designs to be sold in the U.S. and his stores in Virginia. Two years after we met, we married in Richmond. Manuelita Saenz was a legendary and remarkable woman in Latino American history – she was recognized as the “Colonel” by Simon Bolivar, the liberator of Colombia, Venezuela, Ecuador, Peru and Bolivia. She dressed in a military uniform to the disagreement of all politicians. She positioned herself at Bolivar’s right side, becoming his main confidante. And Policarpa Salavarrieta is considered the greatest heroine of the Colombian struggle for independence. She was captured by Spanish Royalists and unjustly executed. "One Hundred Years of Solitude." Garcia Marquez’s magical realism cannot be reproduced. He is the only one! What is something you haven’t done that you’d really like to do? My project when I finally have some free time: Write a book about the productions I have created in English and Spanish, with amazing photographs. In the meantime: Swim with the whales, see the pink dolphins of the Amazon and Orinoco rivers, and help save baby turtles in Cozumel, Mexico, by helping them reach the ocean before dying inside the sand. If you could deliver a message to a large audience, what would it be? Family, love, pride and strength are the most important things in life. Be proud of who you are and where you come from. If you could spend a day with a historical or fictional character, who would it be? When facing problems or obstacles, I am able to come up with a solution fast. My imagination, inspiration and creativity for a new production come to me easier than expected, using no more than the budget and artists we have at the moment. But it is extremely hard for me to say no – or take no for an answer. If you had to pick a different profession or course of study, what would you choose? I cannot picture my life without dancing. My life is always around dance, culture, traditions and history. However, I can see myself traveling around the world, learning the dance, history and culture of every region I visit – and writing a book about what I have learned. What is your favorite thing about the Richmond region? Richmond and Virginia are the history of the United States of America!